Cast of 30,000, take a bow! 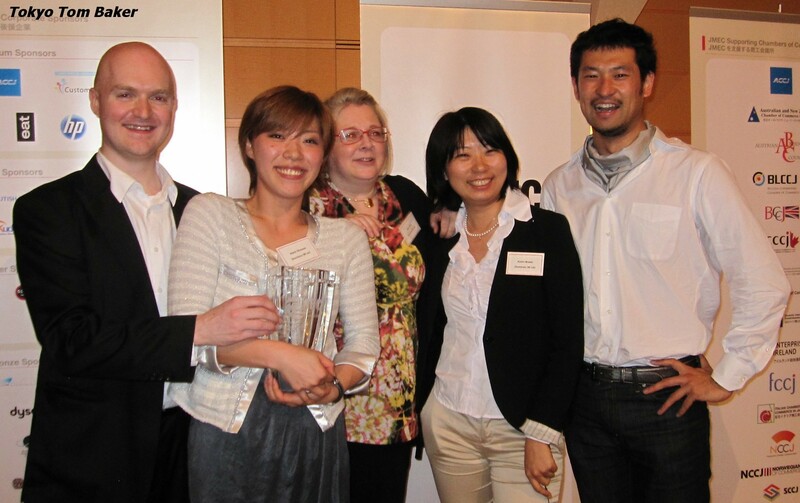 The amazing Kyushu Shinkansen video that I wrote about in a previous post (here) has just won an international advertising award. To refresh your memory, the ad makers asked members of the public to stand alongside the tracks to be filmed as the new train went by. Approximately 30,000 people turned out to participate over the 250-kilometer route. The people who made this ad really know a thing or two about winning over an audience. Not only was their original production brilliant and moving, but take a look at their submission (here) to the Cannes Lions advertising contest. They put major emphasis on the fact that the 250-kilometer route from Kagoshima to Fukuoka is about the same as the distance from Cannes to Geneva – thus turning their “foreign” ad into something the contest judges could instantly relate to in a familiar way. 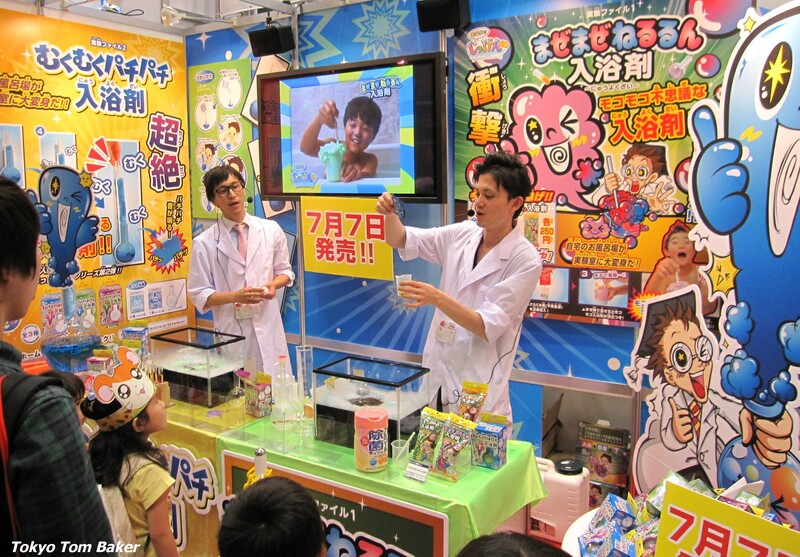 The International Tokyo Toy Show 2011 runs though tomorrow (June 19) at the Tokyo Big Sight convention center. If you’re looking for a cheap diversion, this trade show is open to the public and admission is free. During my visit today, many of the exhibitors were encouraging children to test-play the merchandise. That is certainly to be hoped. In the wake of the March 11 earthquake and tsunami, the ensuing nuclear disaster and resulting electricity shortages, Japan could certainly use an industry that is immune to economic slumps. Whether the toy trade will continue to fit that description remains to be seen. Fiscal 2010 ended on March 31, just three weeks after the quake, and many industries that are now reporting positive results for that year will find a repeat performance in fiscal 2011 to be more than a little challenging. 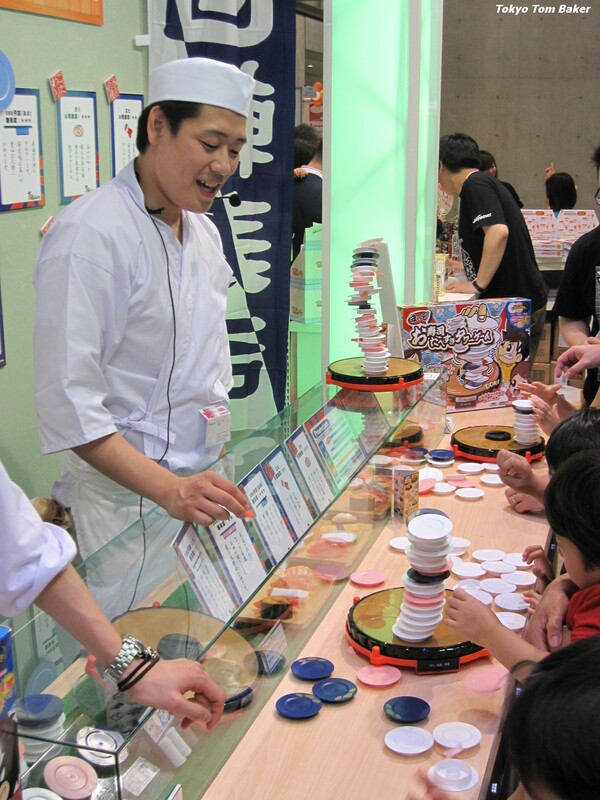 A portion of the Happinet pavilion is made up to look like a sushi restaurant to promote a 3,800-yen game in which players try to stack sushi plates on a revolving platform. The bottoms of the plates have irregular shapes, so deciding which plate will balance best on the existing stack is part of the challenge. Would you like some beer with your sushi? In an ice-cold mug? How about a mug made of ice? The Kawada pavilion had an appealing summer toy for adults in the form of a 1,280 yen set of plastic molds and handles that lets you make a beer mug out of ice. 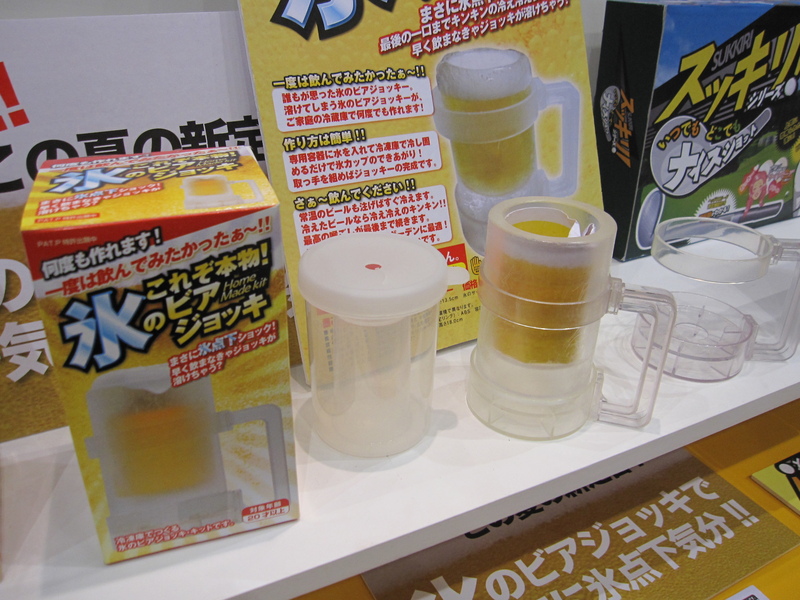 It might be fun to use in conjunction with another item from a different part of the show – the Beer Hour server from Takara Tomy, a plastic device meant to ensure that canned beer has a proper head when you pour it. Running away with the prize for weirdest item that I saw was a faux chemistry set in the Bandai pavilion that lets its users play mad scientist in the bathtub. 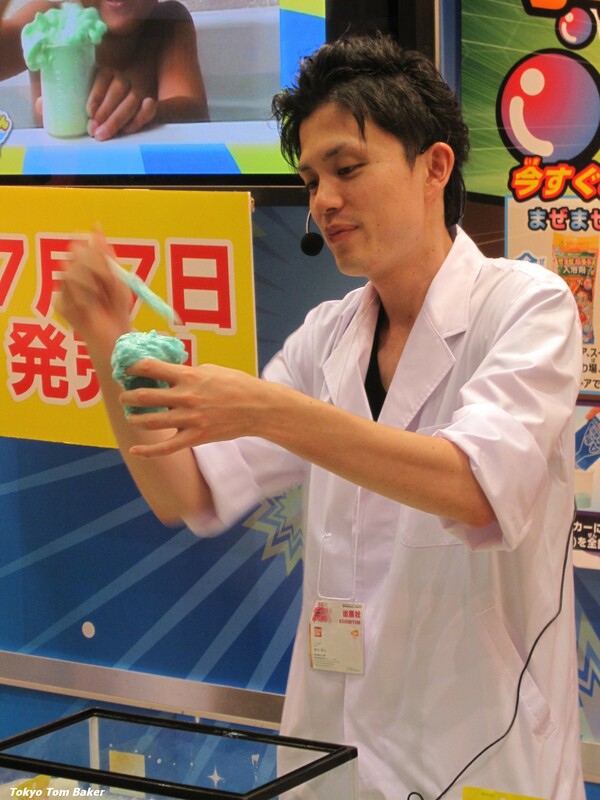 The target audience is boys of primary school age who will mix two different ingredients in a beaker or flask and then watch the resulting substance change color and expand dramatically as it swells up to become a thick foam that appears to be at least as solid as shaving cream. This foam can then be dissolved in the bath – it seems that a certain amount of splashing is required – to change the color of the water. The product is called “Mazemazenerurun Nyuyokuzai,” and it is meant to be the first in a series of products sold under the aegis of a crazed-looking mortarboard-wearing mascot named Ofuro de Jikken-kun, whose name translates approximately as “Young Mr. Experiment, in the Bath.” The sets will sell for about 250 yen. 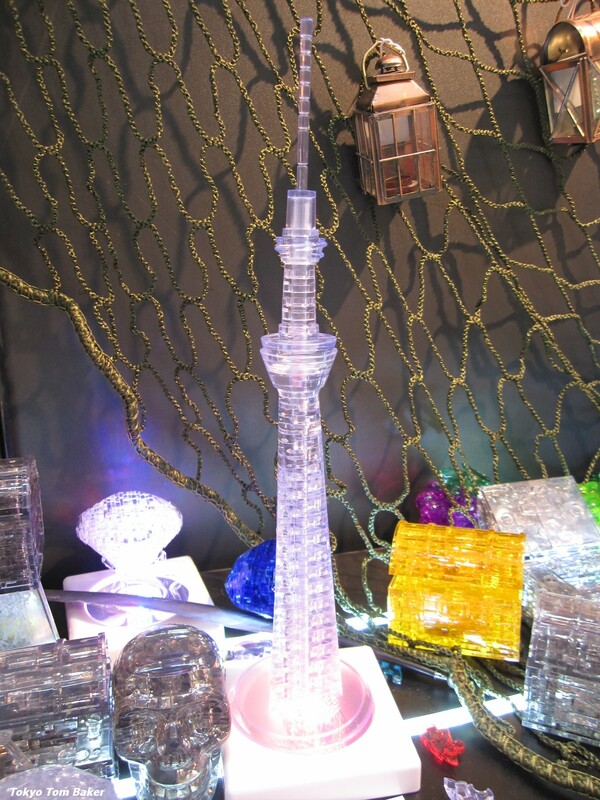 One of the newest additions to Beverly’s line of crystal puzzles is this model of the Tokyo Sky Tree. The new Tokyo landmark also appeared in a variety of other products throughout the show, including puzzles, models, and a 126-centimeter-tall coin bank from Wiz that claims to be able to hold 634,000 yen if filled with 500-yen coins. The show catalog also included a “Tokyo Sky Tree Balance Game” from Takara Tomy. Players must stack components of a 63.4-centimeter model of the 634-meter tower and hope that it doesn’t topple and smash before they are done. I wonder if that’s really the image the Sky Tree builders want to project. 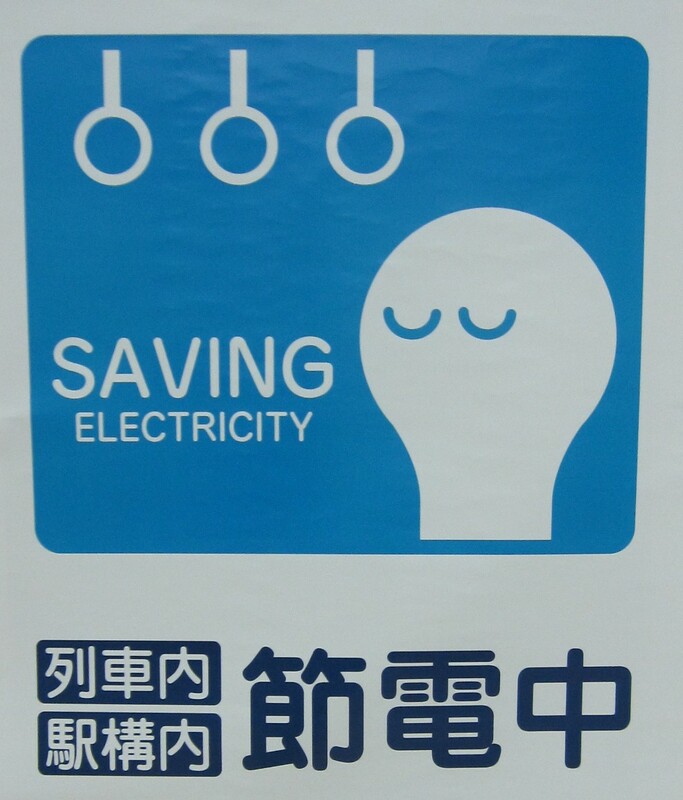 In yesterday’s post I described what I consider the best-designed of the countless setsuden electricity-conservation posters that have been going up all over the Tokyo area. Today I’d like to show you the one with the best wordplay. The posters in my previous setsuden gallery are aimed at the general public, but the one in the photo above was designed for a more specific audience. 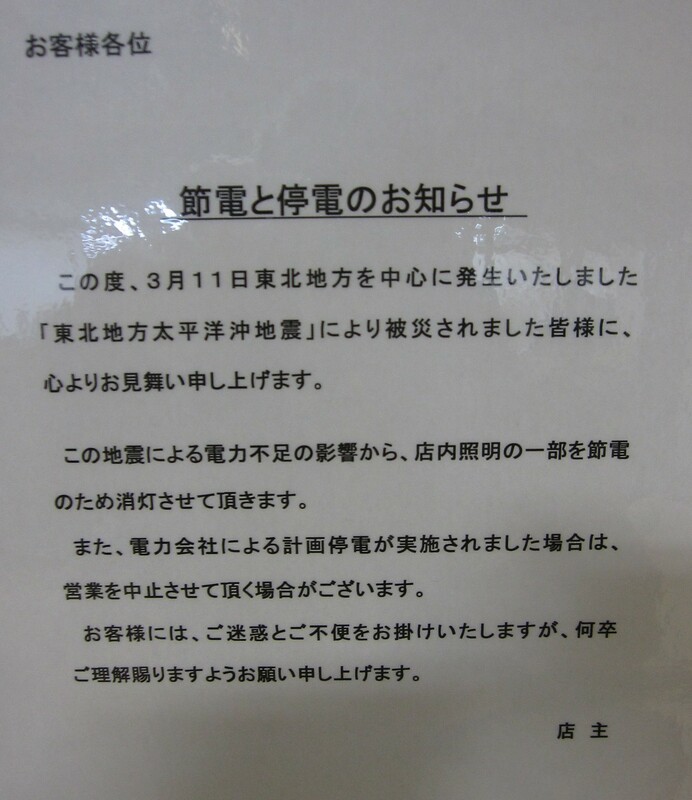 It was produced by the Fitness Industry Association of Japan, and I found several copies of it posted around the sports club where I usually swim. Its wordplay is based on the rhyming Japanese words denki and genki. “Denki,” shown here in kanji, Roman letters and hiragana, means electricity. “Genki” is a very common word sometimes translated as “health.” It also has connotations of fitness, peppiness, high spirits and good cheer. According to one of the dictionaries on my desk, it can be used to describe a “bouncing” baby or a “spry” old man. The closest all-purpose single-word definition I can think of for genki would be “vitality.” It is technically a noun, but most often functions as an adjective. Everyone in Japan these days wants to save denki. Everyone who joins a Japanese sports club wants to be genki. Usually these words are written in kanji OR hiragana. But as you can see, the poster has mixed the two writing systems to make the words more closely resemble each other in visual terms. Not only the words but also the visual design certainly fit the context in which this poster is seen. 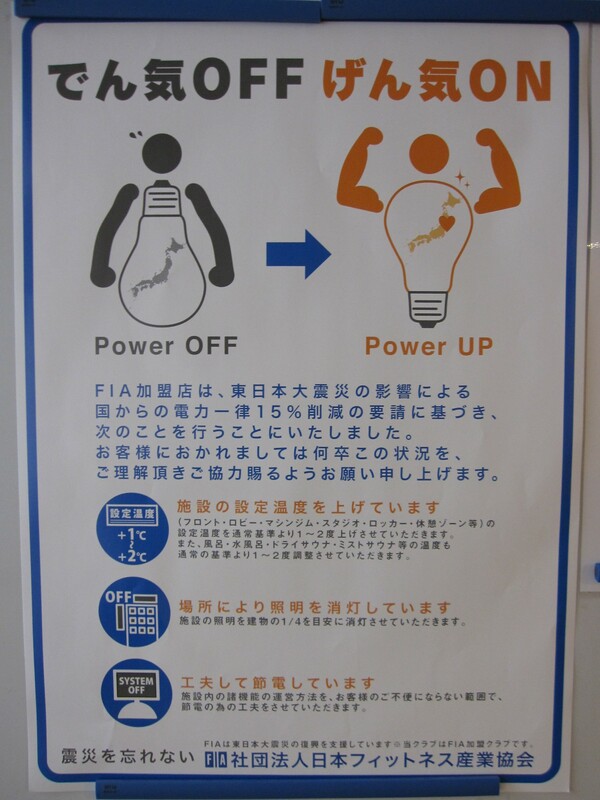 It shows two light bulbs situated in such a way that one of them resembles a pear-shaped human torso while the other resembles a V-shaped torso. Since this calls to mind the very transformation many of the club’s members probably joined in hopes of achieving, it is likely to catch people’s eye through its connection with what is already on their mind. 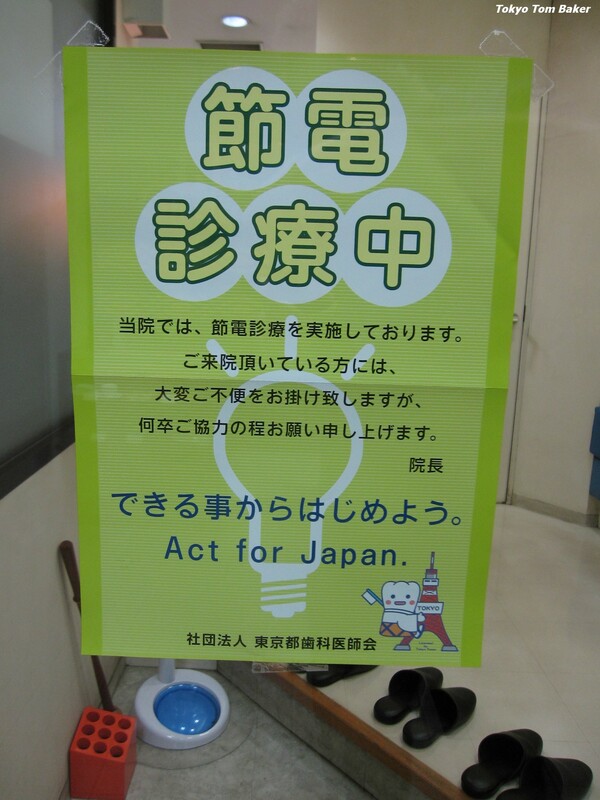 In my previous blog post, I showed a gallery of setsuden electricity-conservation signs that have been going up all over the Tokyo area. But I left out two of my favorites, including the one in the picture above. (Click on it for a larger view.) This has the best graphic design of any setsuden poster I’ve seen so far. 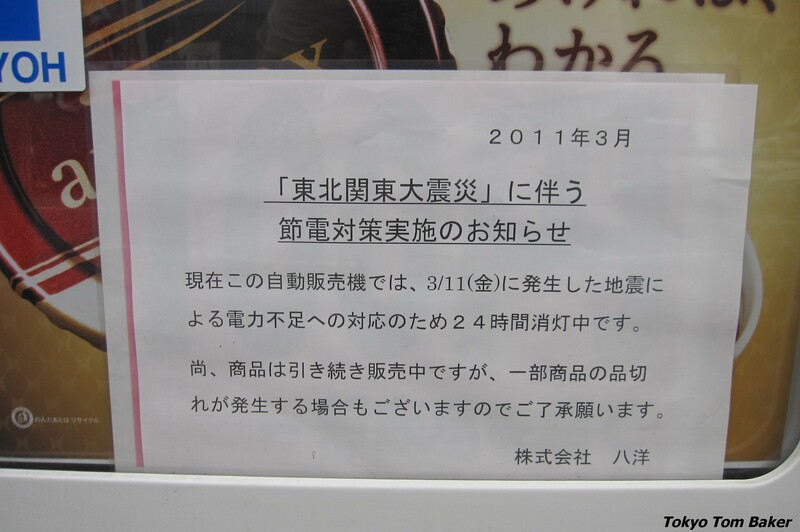 This poster is appears all over the Tokyo area railway system, and I see it at dozens times of on my daily commute. 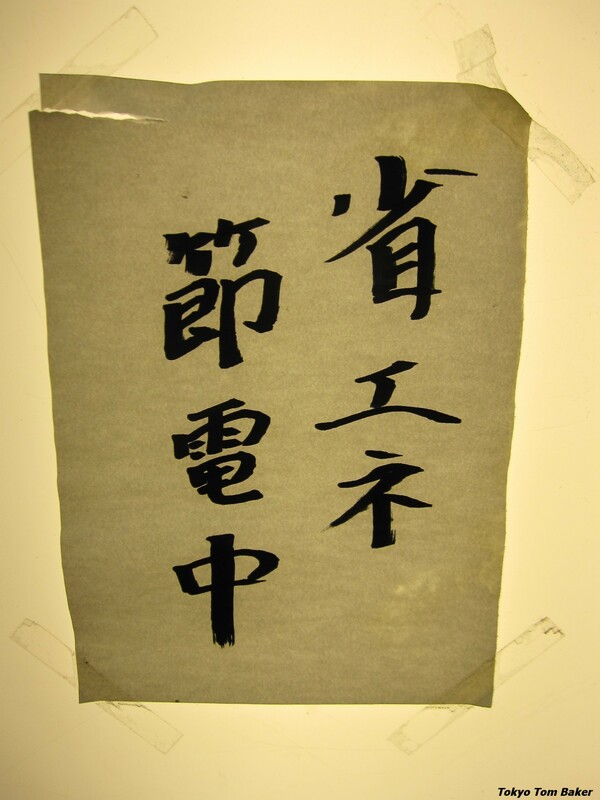 Its first virtue is simplicity, with “Saving electricity” in large print in English and Japanese, with very little additional text. As for the picture, it has only two elements – a light bulb and a row of subway straps. These two visual elements are enough to tell a story. 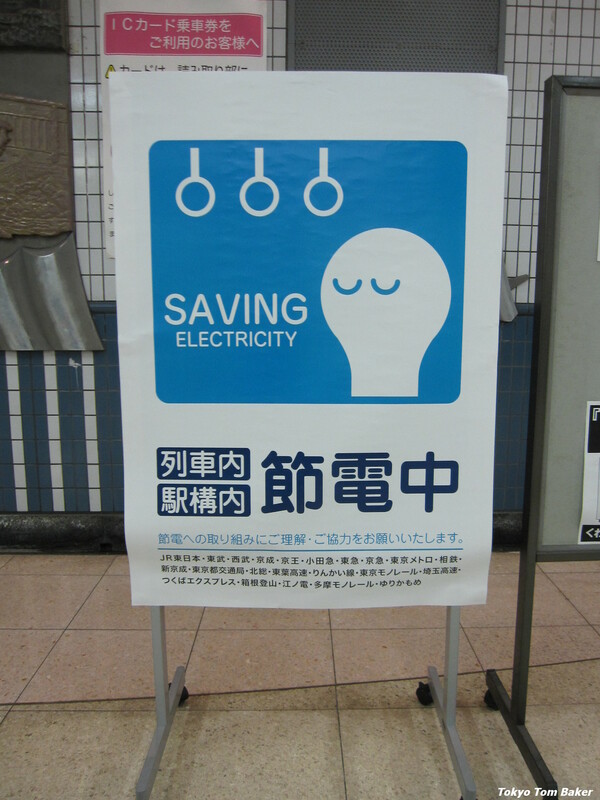 The bulb has eyes that make it a character, and the straps place the character aboard a train. The image is not quite symmetrical, but it has an interesting balance that holds the viewer’s eye, with the single big shape of the bulb mirrored upside-down by the smaller shapes of the straps. In keeping with popular Japanese aesthetics, the character is cute – but not overly so. The shape of its eyes makes it look modest and serene. Perhaps it’s even slumbering. No doubt the railroads hope some of these characteristics will rub off on frazzled commuters as the non-air-condititioned trains grow hotter and hotter this summer. The image is further softened and made even more soothing by the almost total absence of sharp edges. The bulb is rounded, its eyelids are gently curved, and the strap handles are perfect circles. The blue field in which these elements appear is only approximately a square, and its corners have been rounded. The English typeface has no bristly serifs. Even the naturally angular letters A, V and N in the word “saving” have had their points sanded smooth. In the Japanese text, too, the end of each stroke is round rather than square, pointed, or trailed out in a spiky brush stroke. Admittedly, the ultra-round pattern is broken by a few 90-degree angles, such as at the tops of the straps and the base of the bulb. These look like deliberate choices to suggest that the objects continue to exist beyond the borders of the frame. But every angle that can be eliminated has been eliminated. Next to the three large navy blue characters for “Setsuden-chuu” are two text boxes. 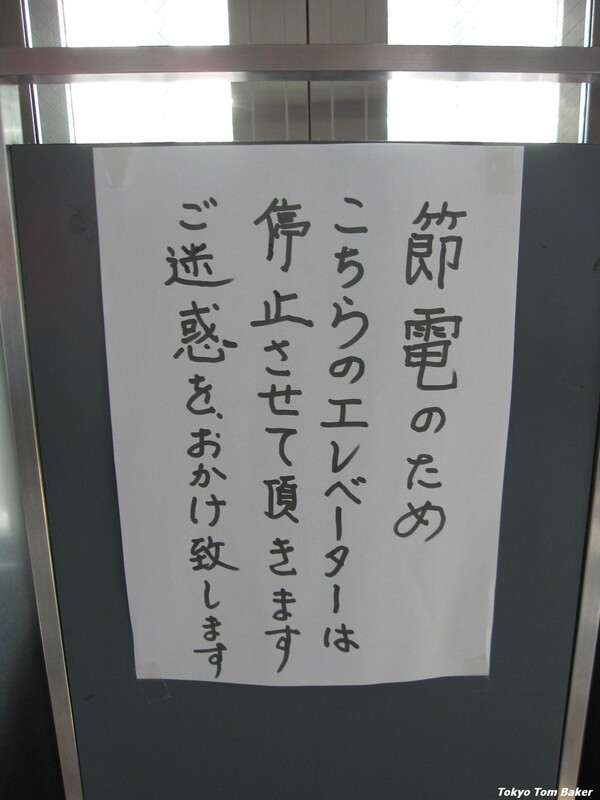 One says “Aboard trains” and the other says “In stations.” Below that is a line of mizu-iro text that says, “Please understand and cooperate with our efforts to save electricity.” The small text below that is a list of 22 large and small railways (including two monorail lines) operating in the Kanto area. Lights inside backlit station signs and advertising billboards have been turned off. Escalators have been turned off. Air conditioning has been turned off. 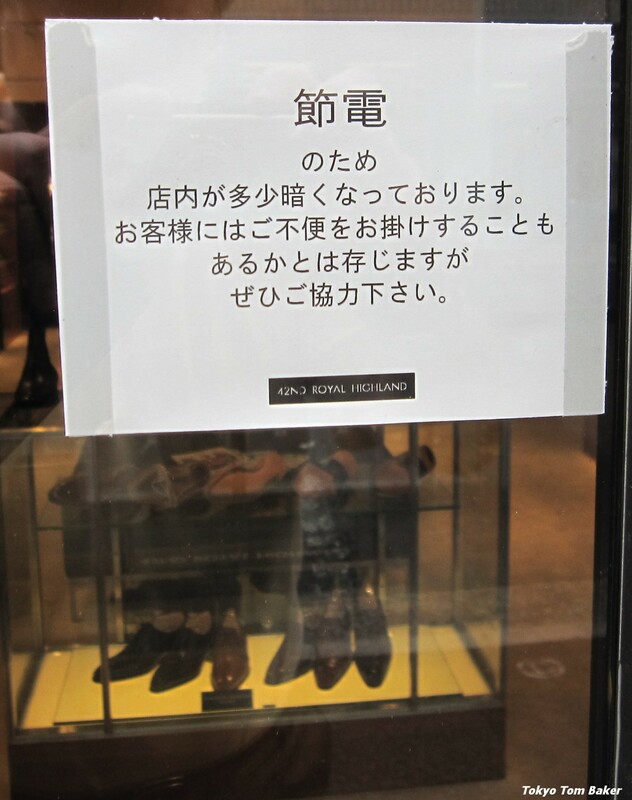 High-end shops in Ginza don’t normally plaster their windows with hastily photocopied announcements, but the photo above shows that a men’s shoe store that ritzy district has become one of countless Japanese businesses to jump on the “setusden” bandwagon. 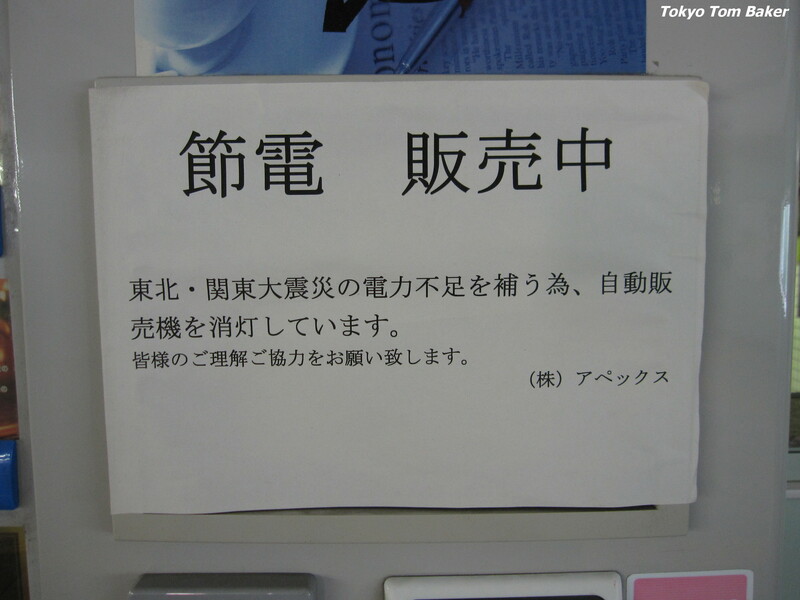 “Setsuden” means “saving electricity.” The sign in the shoe shop window informs customers that the shop is lit more dimly than usual for the sake of conserving power. With many of Japan’s power plants shut down as a direct or indirect result of this spring’s earthquake and tsunami, “setsuden” has become this summer’s big buzzword. The term is written with the pair of kanji characters at the top of the shoe shop’s sign. Take a moment to look carefully at those characters. If you live in Japan or plan to visit (and please do visit — our economy over here could use the help), you’re going to see these two characters everywhere. 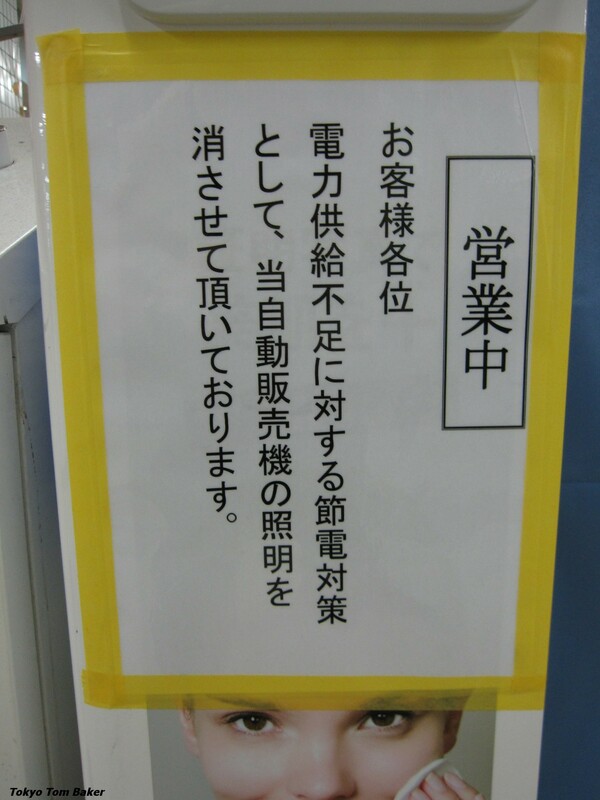 For example, here is a sign at an entrance to the Matsuya department store in Ginza, telling customers that the air conditioning has been turned down to save power. The message is printed on a background shaped like a hand-held paper fan, suggesting an alternative way to keep cool. 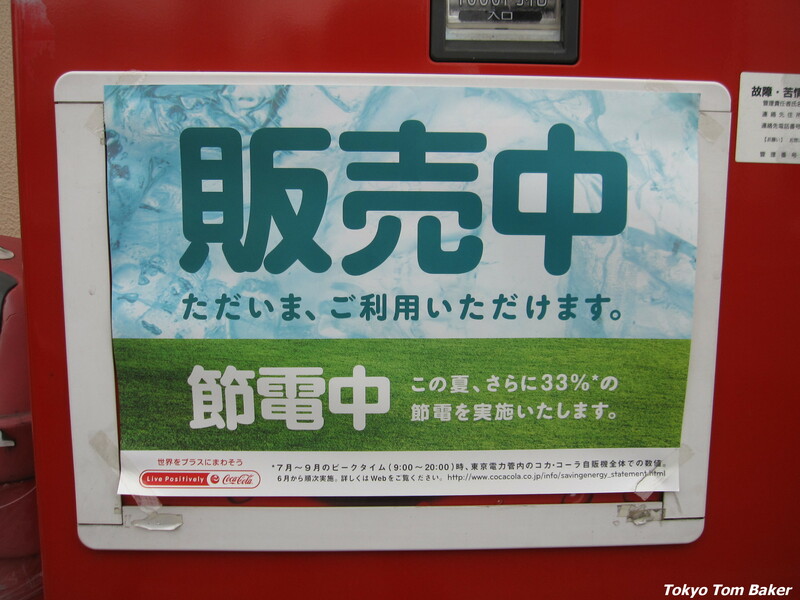 The fan’s lettering reads, “Kotoshi wa, setsuden o kangaeruu,” which means, “This year, we are thinking about saving electricity.” The last word is written in katakana phonetic characters to emphasize that it is a pun. “Kangaeru” is the correct Japanese word for think, but here it has been slightly altered to make it sound more like “kangaruu,” which is the word for kangaroo. And that’s why there is a kangaroo holding the fan — not just because it is cute. The power hand driers in many public restrooms have been turned off to save electricity, such as this one I photographed at a shopping mall in the Tokyo suburb of Kawaguchi, Saitama Prefecture. Here, the two characters for “setsuden” are followed by a third character. This simple-looking character is an extremely versatile one with many uses, but here it is pronounced “chuu” and means “in progress,” “under way,” or “in the middle of.” It is often used as a suffix to words that describe activities, so here it means something like “now conserving energy.” Walking around town, you’ll see the three characters for “setsuden-chuu” quite a lot. 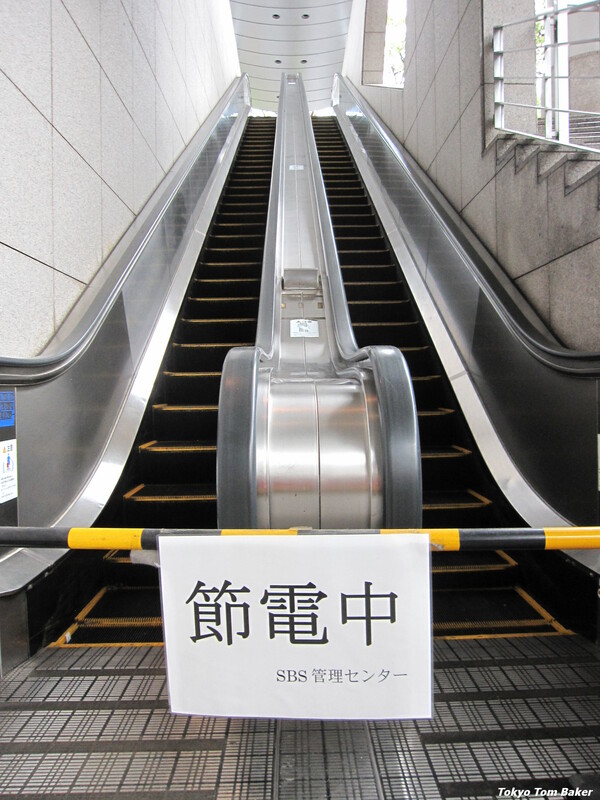 For example, here we see “setsuden-chuu” on a closed escalator at Yoga Station on the Denentoshi Line in Setagaya Ward, Tokyo. 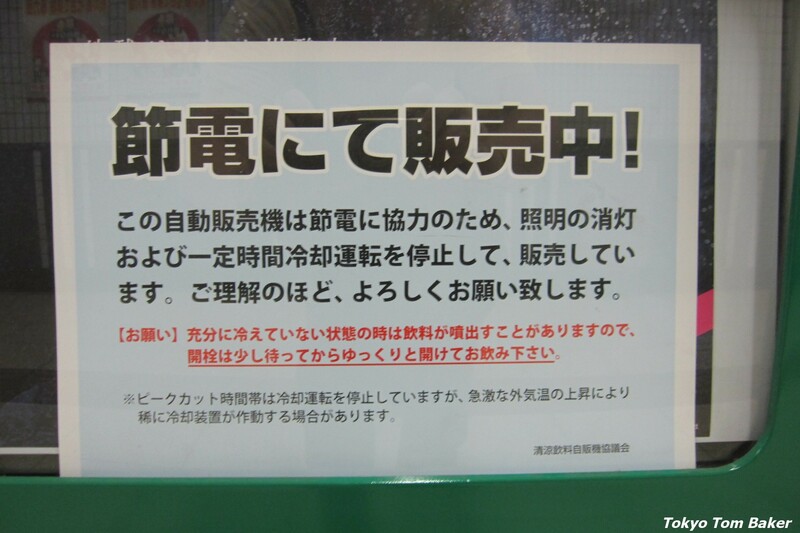 And back at the Kawaguchi mall, here are two “setsuden-chuu” signs, explaining why an advertising video screen and a beverage heater/cooler have been turned off. 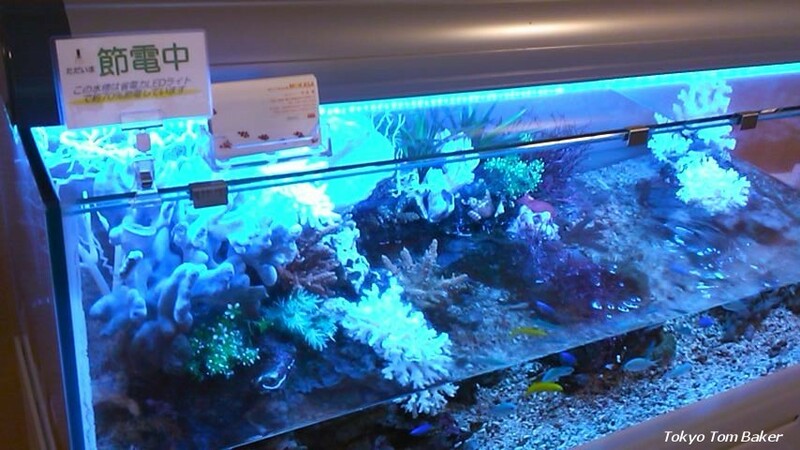 Even fish are getting into the act, with these specimens in the lobby of my sports club bragging that the light in their tank is from LEDs. Here’s a Ginza dental clinic whose setsuden sign includes an anthropomorphic tooth mascot climing Tokyo Tower in King Kong style. 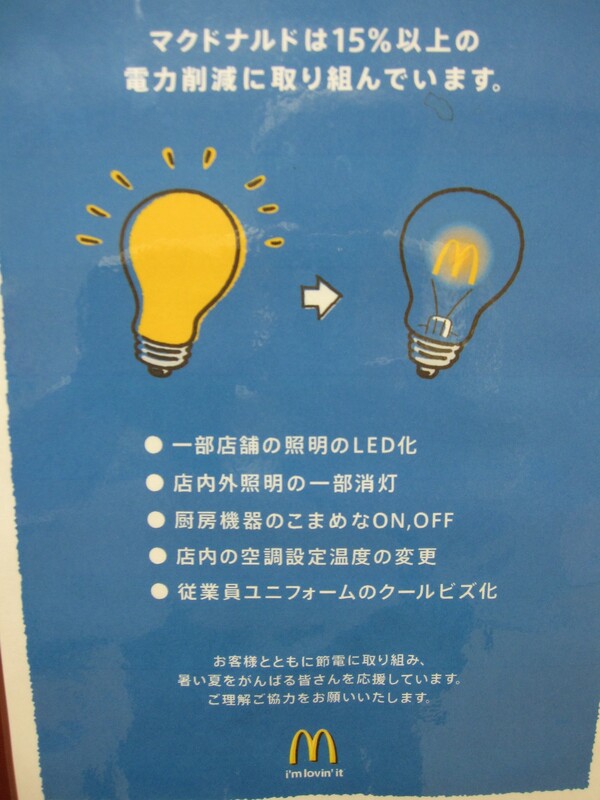 The McDonald’s at Korakuen subway station in Tokyo is displaying a setsuden sign that turns a lightbulb filament into its golden arches. I’m not sure this is such a good idea, because at first glance it seems to associate their logo with electricity use rather than savings. 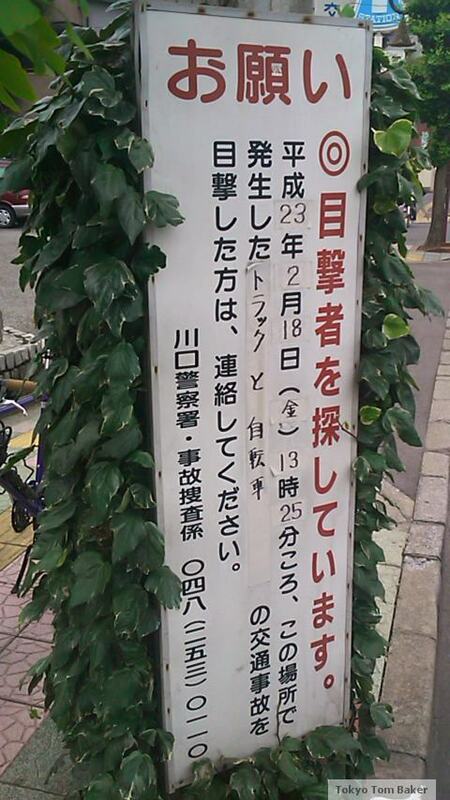 The word “setsuden” is not prominently displayed on this poster, but it’s there if you look. One of McDonald’s restaurants is a tonkatsu pork cutlet restaurant that has a much plainer setsuden sign. 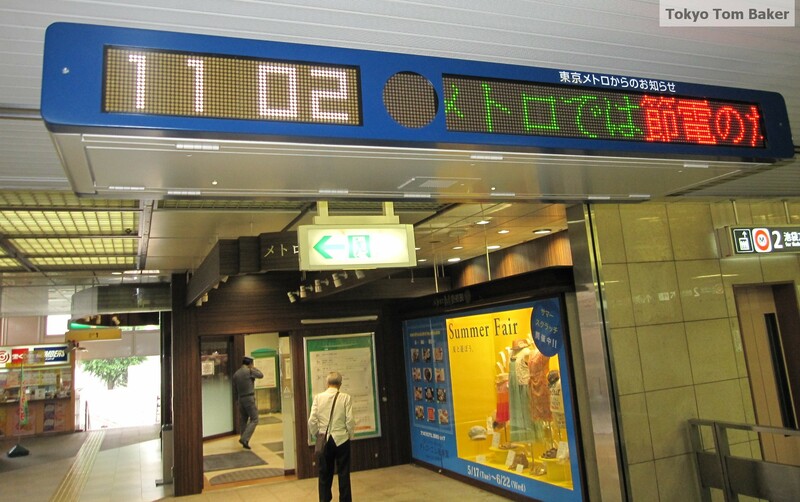 While I was at Korakuen Station, I noticed the word “setsuden” crawling past on an electronic announcement display. This might strike some people as ironic, but if the displays have to be kept on to inform passengers of information such as suicide delays, they may as well also include some positive messages about saving energy. 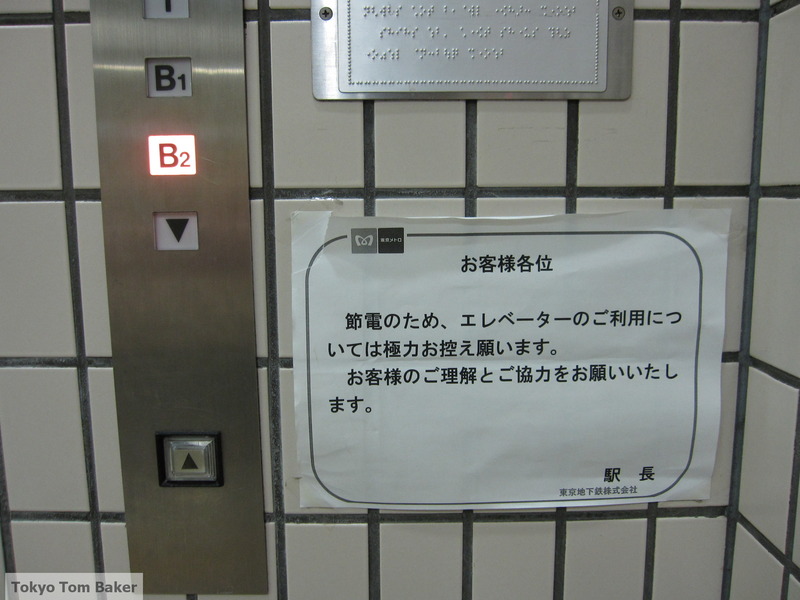 The elevators were also still on at the station — as they must be for the sake of the disabled, the elderly and people with baby carriages — but this sign asks, “stesuden no tame” (for the sake of setsuden), that people refrain from using them as much as possible. 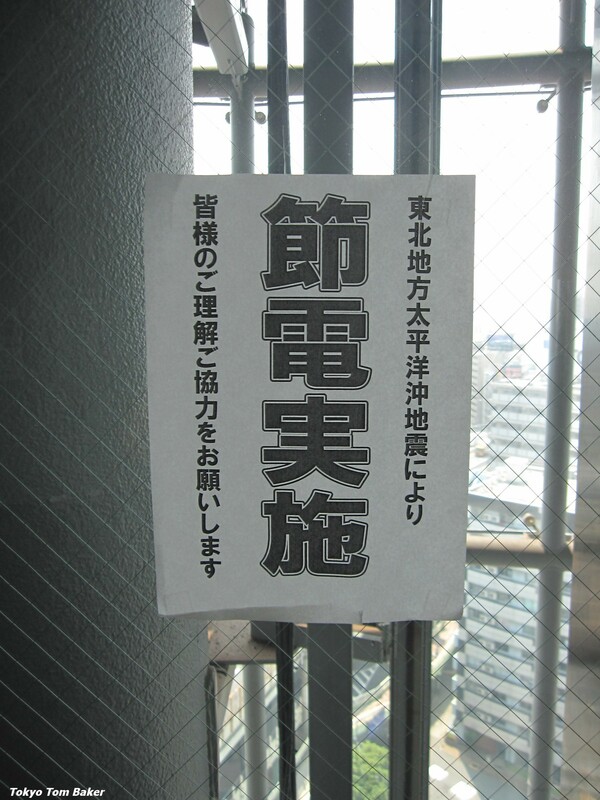 Meanwhile, at a similar facility in Ikebukuro, Tokyo, which has its entrance on the ninth floor, a setsuden sign announces that the middle elevator in a bank of three has been shut down to save energy. The air conditioning in the elevators apparently had also been shut off at the time of my last visit there, and air inside the glass elevator cars was baking. 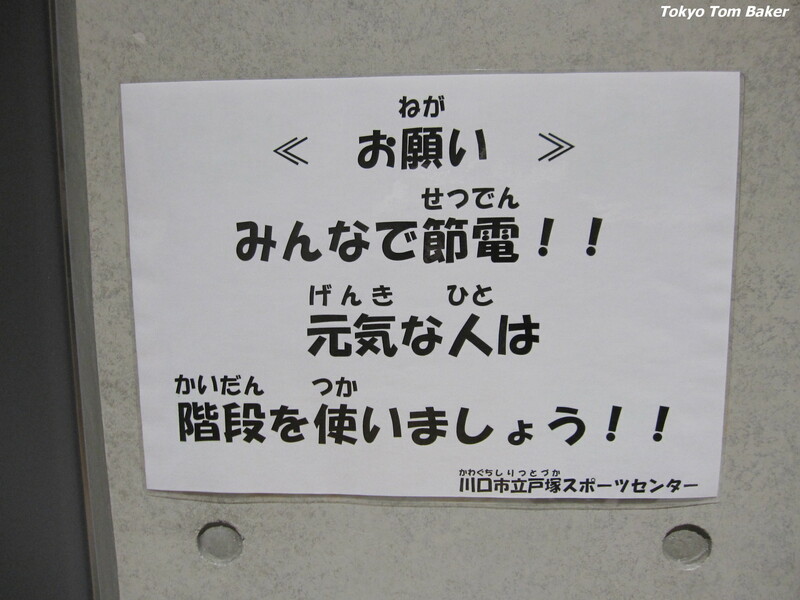 A setsuden sign upstairs in the same building asks for everyone’s cooperation. 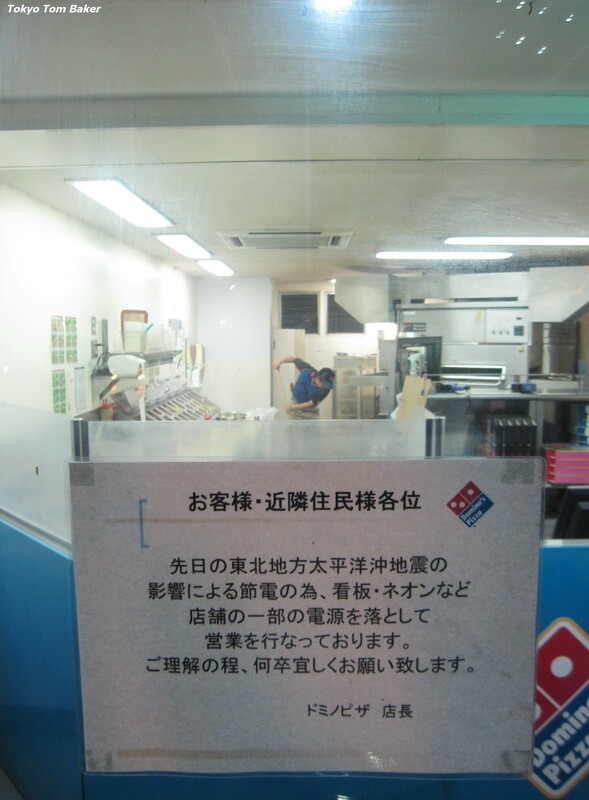 A sign in the window of a Domino’s pizza shop in Kawaguchi announces that their setsuden measures include turning off their neon sign. 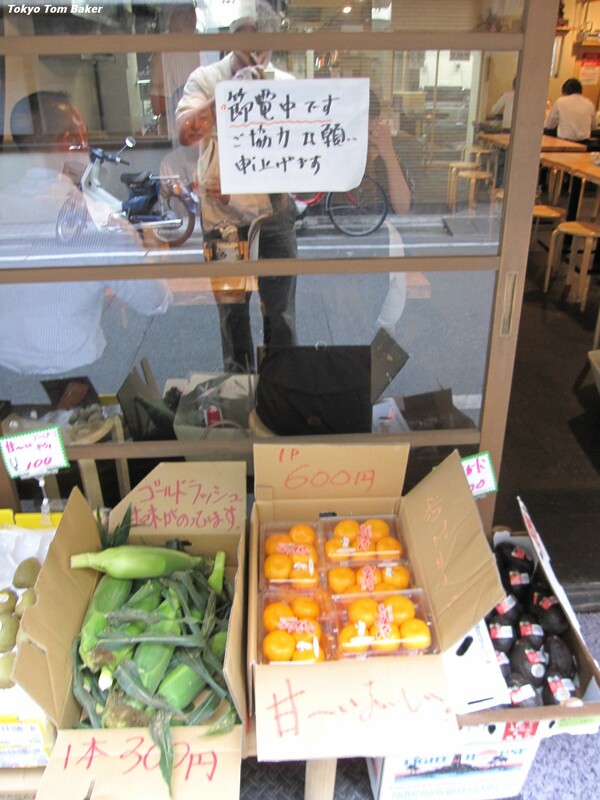 Daitune, an udon and tempura shop in Ginza where I had lunch yesterday, has a hand-written setsuden sign in its window. There was no air conditioning inside, but the doors were kept wide open. 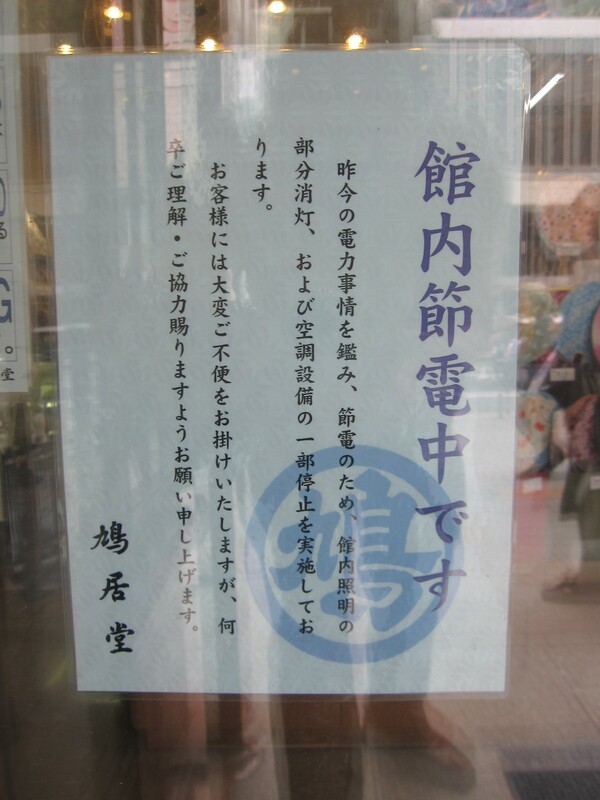 A bar in the Yaesu district adjacent to Tokyo Station had a similar sign, and a similar practice. Here’s a close-up of the Yaesu bar sign. Next to the word “setsuden-chuu,” you can see three characters that are read “shou-ene.” This is short for “shou-enerugii,” which means saving energy. This seems redundant to me, but it is another common feature of many setsuden signs. 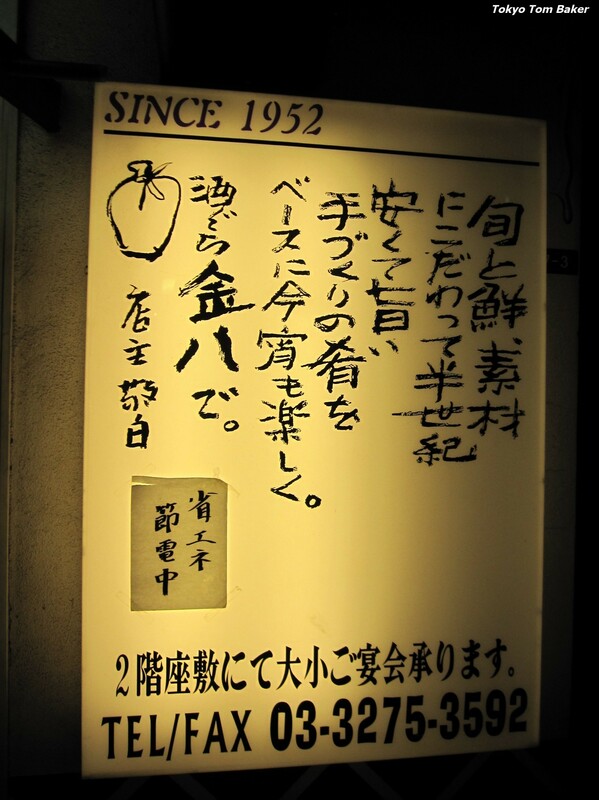 Here’s a setsuden sign at a bar in Ginza. 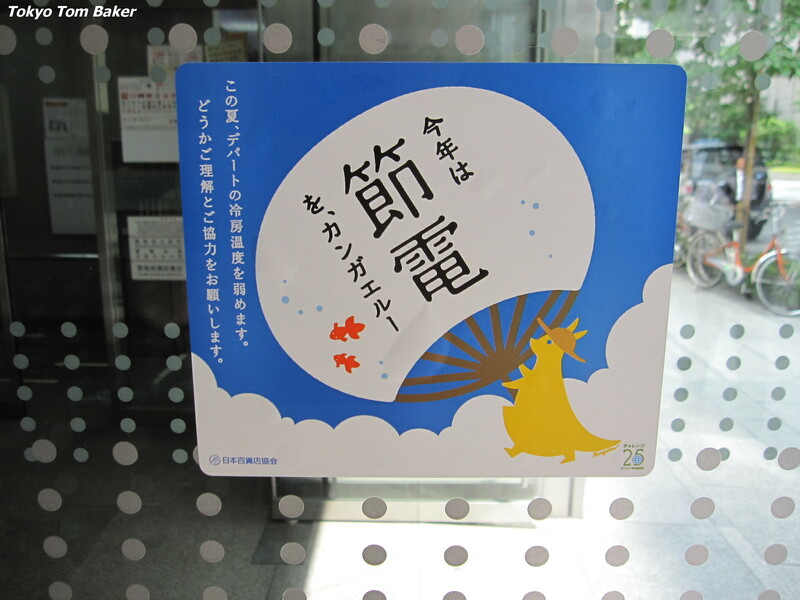 This setsuden sign is in the front window of a Ginza shop called Kyukyodo, a purveyor of traditional Japanese luxury goods that is currently emphasizing its selection of elegant fans and cooling furin wind chimes. They should do a booming business this summer. 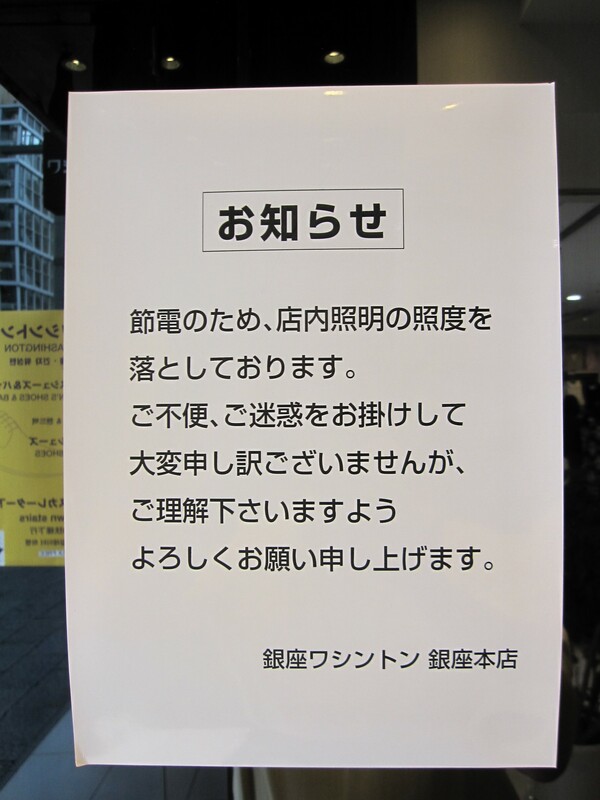 This setsuden sign at the Washington Building, home of Uniqlo’s main Ginza store, says that the lights have been dimmed. 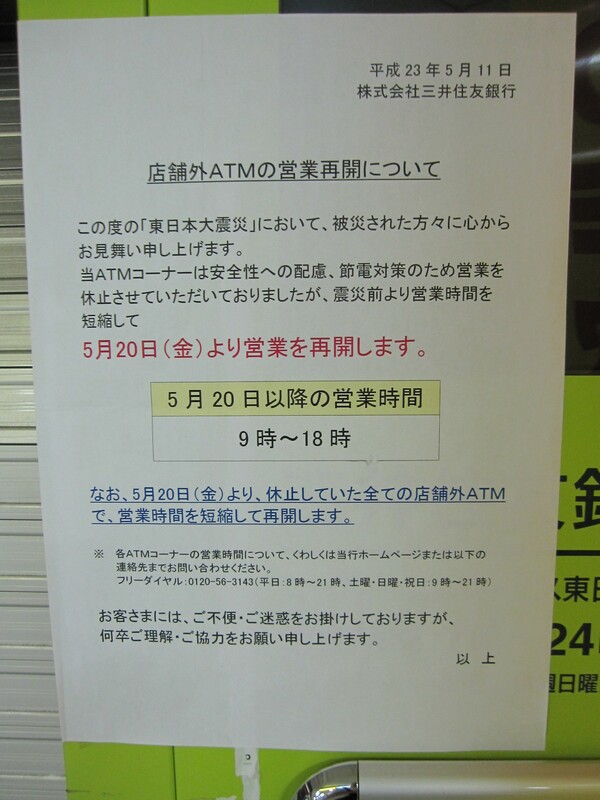 This setsuden sign on an ATM in Korakuen Station says its operating hours have been reduced to 9 a.m. to 6 p.m. to save electricity. 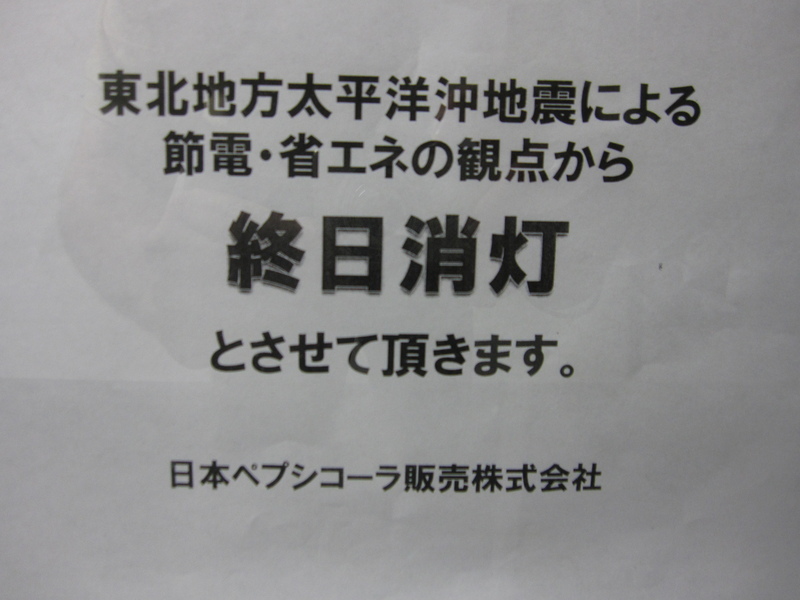 A sign at an ID photo booth in the same station says its lights — presumably not including the flash — have been dimmed for setsuden. 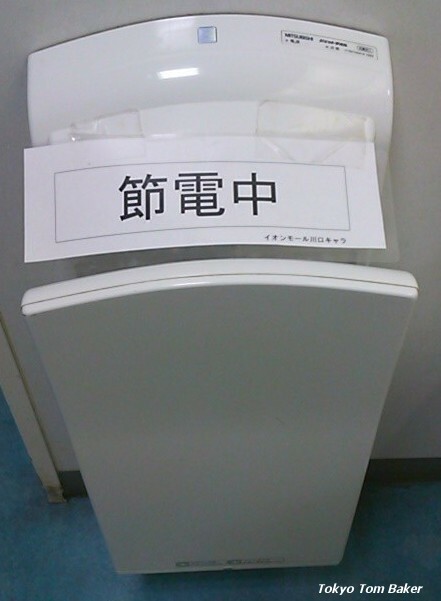 Interestingly, the sign describes the machine as a “jidoubaiki,” or vending machine. Before stopping to take this photo, I hadn’t realized that photo booths count as vending machines in Japanese. 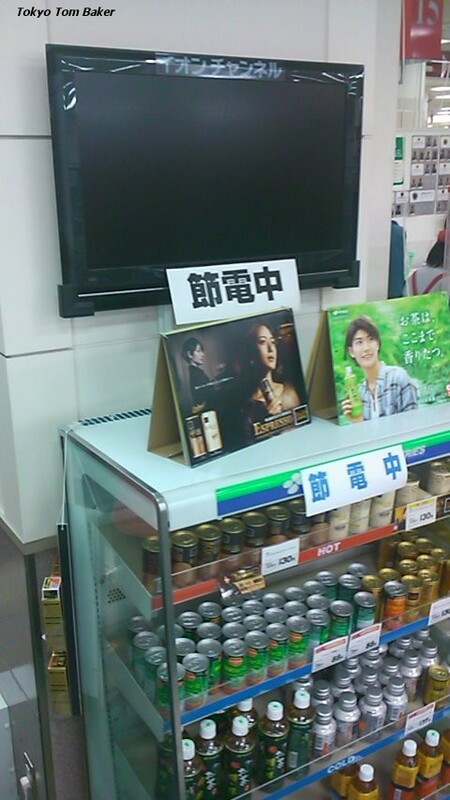 Here’s a setsuden sign on a more conventional vending machine, run by Pepsi Japan. Here’s a setsuden announcement at another dimly lit vending machine. In addition to reducing or turning off their lights, many vending machine operators have also reduced the daily hours during which their refrigeration units are running. 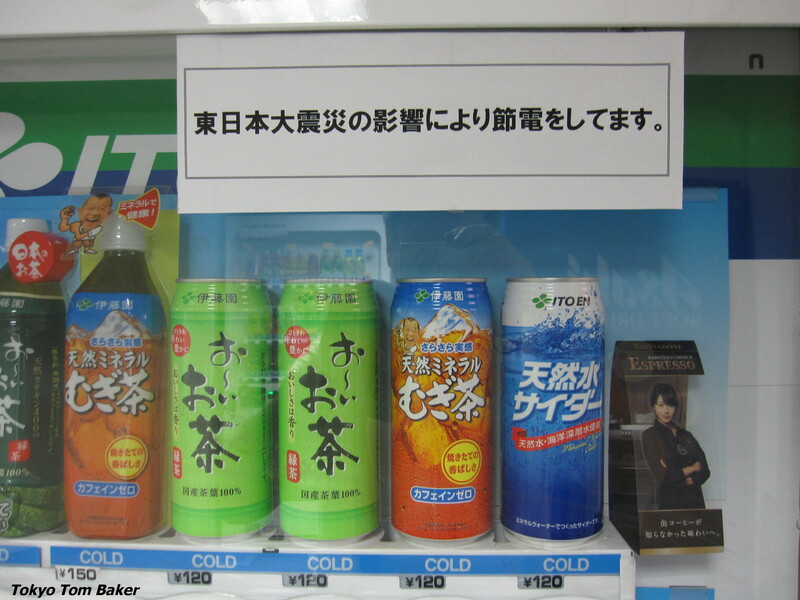 On this drink machine’s sign, “hanbai-chuu” gets pride of place, and “setsuden-chuu” gets second billing. Here they get more equal emphasis. And here’s one more drink vending machine pleading its case. Vending machine companies have been on the defensive since Tokyo Gov. Shintaro Ishihara condemned their business as wasteful, but if you live or work in Japan and don’t belong to a group that Ishihara has criticized, then you probably aren’t doing anything interesting or worthwhile. 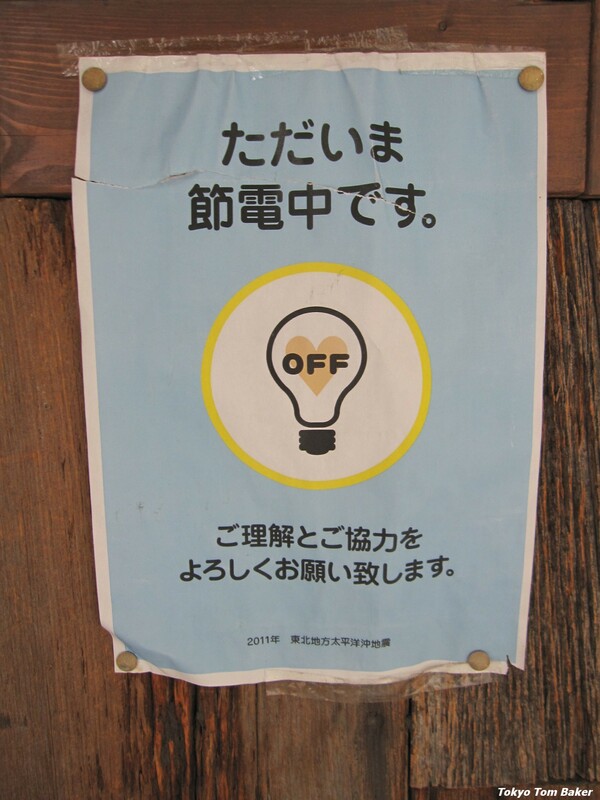 This has been quite a long blog post, but there are two special setsuden signs that I have left out. The signs to which I refer are my favorites — one for its appealing visual style, and one for its amusing wordplay. The’re so good I’m going to give them each their own blog entry later this week. So stay tuned! Here’s my pick for best design on a setsuden sign. Read more about it here. And here’s my pick for best wordplay — a setsuden sign that uses bilingual puns. Read more about it here. If you witnessed an accident involving a truck and a bicycle at this location around 1:25 p.m. on Friday, February 18, 2011, please come forward. Posting this kind of sign at an accident scene strikes me as a good idea. But considering that nearly four months have passed, and that the sign has been up long enough to have ivy curling around its edges, I have to wonder whether this particular case is going well. You are currently browsing the Tokyo Tom Baker: The Blog blog archives for June, 2011.